More than 50 participants, including runners and walkers of many ages, and even a few toddler riders, gathered at Fuller Park in Albion Saturday morning to enjoy perfect weather for the 5th Annual Louie Hoppe 5K Run. Proceeds from the event will again go to the Louie Hoppe Memorial Scholarship. Boone Central students Macy Olson and Jacob Nore received scholarships this year. 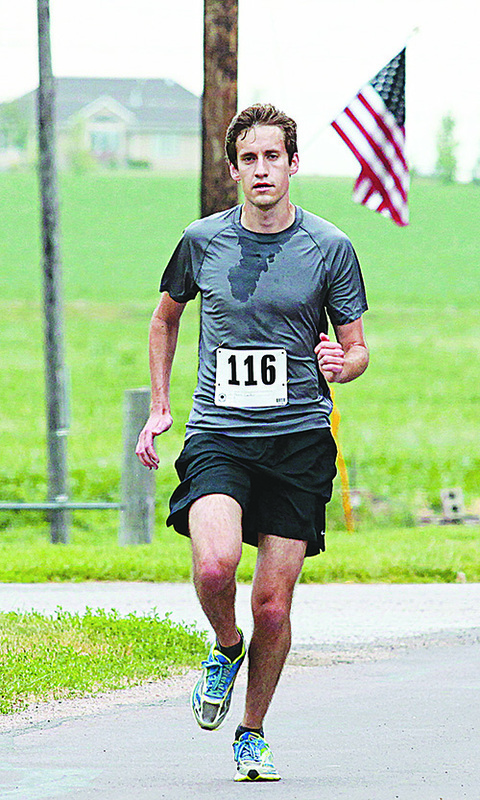 Albion native Kevin Carder was once again the overall winner of the 5K run in a time of 18:11. He paced the male runners ahead of Jason Hagemann (23.24) and Sam Hoppe (24.24). Overall winner among females was Velda Jacobson (25.49), followed by Shannon Hagemann (27.22) and Ashley Thieman (30.07). Female 14-under – Julia Nore (30.36); Male 14-under- Sam Hoppe; Male 15-20 – Chris Preister (24.41); Female 21-31 – Ashley Thieman; Male 21-31 – Kevin Carder; Female 32-42 – Shannon Hagemann; Male 32-42 – Jason Hagemann; Female 54-up – Velda Jacobson.